When it first came to Canada in 2005, the smart fortwo sent shockwaves through the country. Everyone wanted to know where this pocket-sized car came from, whether it had an electric motor, where it was built, etc. Imagine the public’s reaction when they learned that it was powered by a diesel engine, made by Mercedes-Benz and had been zipping around the streets of Europe for years already! Opinions weren’t just divided, they were totally polarized, with some people expressing complete disdain and others falling head over heels in love. As the smart fortwo heads into its third generation, let’s look back to how it first came to be. It all started in 1972, when Mercedes-Benz decided to explore what cars of the new millennium would look like. The 1973 oil crisis confirmed that they should move forward with a small city-bound car, as the company realized that transportation trends were going to change dramatically in the coming decades. The first sketches were for a two-seater with a front-mounted electric motor powered by batteries stored in the rear of the vehicle. With a plunging nose, a truncated rear and a super short wheelbase (for a total length of 2.5 metres), this design marked a major departure from Mercedes-Benz’s massive sedans and sports cars. But the project was quickly put on ice as the vehicle didn’t meet the stringent safety standards established by the three-pointed star brand. It wasn’t until 1981 that plans for a small city car were tabled again. The NAFA (Nahverkehrsfahrzeug or Local Traffic Vehicle) project involved a much more box-like car, in line with current trends. But once again, the plug was pulled. The public (namely, the American public) preferred larger vehicles, despite the second oil crisis of the late 1970s. Ironically, this urban vehicle would have helped Mercedes-Benz meet the U.S.’s new CAFE (Corporate Average Fuel Economy) standards. Fast-forward to 1988. Mercedes’ engineers revived the NAFA project and tacked on an electric engine this time. Two separate teams worked on two separate projects. One was the Vision A 93 that was unveiled at the 1993 Frankfurt Motor Show and eventually became the A-Class. The other was a much slower moving initiative called the MCC (Micro Compact Car). In 1991, the MCC progressed to the development phase at the brand’s new design studio in California. Project director Gerhard Steinle sent his troops out to examine the lifestyle of city slickers. On July 4th, 1992, Mercedes’ board members were finally shown full-scale plans for the car, which convinced them to approve the construction of a functional prototype. The idea of a MCC convertible was already floated at this stage. While work on the MCC continued, something totally unexpected happened in Germany. Nicolas G. Hayek, the man who revolutionized the world of wristwatches with the Swatch, had a new stroke of genius and wanted to apply the same manufacturing strategy to build cars designed for city use. No fool, he knew he couldn’t do it alone, so he approached Volkswagen, only to have his proposal shot down. On December 3rd, 1992, he met with the president of Mercedes-Benz AG, Werner Niefer. Mercedes’ meeting with multi-millionaire Hayek proved very timely, since automakers in that era were actively looking for partnerships with suppliers to reduce production costs. A month after their first meeting, Hayek presented his vision of the MCC, the Swatchmobile. Although he wanted it to be an electric vehicle, associated production costs were deemed too high. But this didn’t stop Niefer from announcing at the 1993 Geneva Motor Show that the tiny car would go into production. In March of the following year, both the coupe and cabriolet are presented to the public. The coupe featured an electric motor while the cabrio was equipped with a three-cylinder gas engine. One month later, the partnership between Daimler-Benz and SMH (Swiss Corporation for Microelectronics and Watchmaking Industries Ltd.) was made official. Daimler-Benz held a 51% share of the MCC (MCC GmbH), while SMH held the other 49%. But disagreement between Hayek and Mercedes soon surfaced. Whereas Hayek envisioned a small electric car in flashy colours, the German automaker clung to a gas/diesel engine and overall car safety. The two partners agreed that their first car, which had until then been known as the MCC, would be called the Eco Sprinter. It would be promoted as a smart car for the 21st century, developed jointly with Swatch. The “smart” name soon emerged, though it officially stands for Swatch Mercedes Art. Hayek, however, refused to give up on the electric engine and developed his own four-wheel drive version with an electric motor for each wheel. He invited delegates from Mercedes for a demo, but unfortunately things didn’t go as planned. This reaffirmed Mercedes’ commitment to gas or diesel technology—and deepened the rift between the two parties. While Hayek’s influence on decisions diminished, he remained one of the leaders behind the smart’s innovative production methods. In December 1994, they decided that the little car would be built in a new plant in Hambach-Sarreguemines, France. 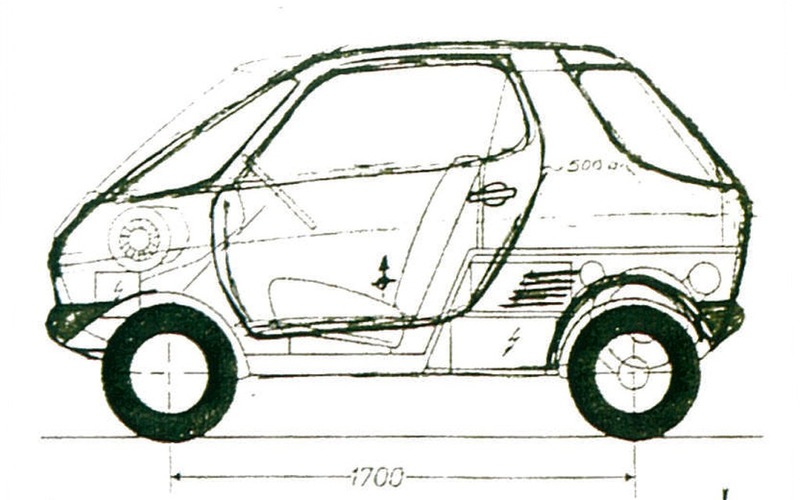 By April 1995, the design for the future smart was set, with no changes until its official production. The car was presented at the 1996 Olympic Games in Atlanta, as well as the Paris Motor Show in September of the same year. Building the new plant and putting the vehicle into production required capital injections that ran deeper than Hayek’s pockets. In February 1997, he sold his remaining shares to MCC AG and bowed out of the project. The production version of the smart was officially introduced at the Frankfurt Motor Show in September 1997. Then on October 27th, the first unit rolled off the assembly line. The rest is history.